After activated the plugin the Cleaner will working automatically. The Cleaner automatically clean your content without any click, just activate it and will just hide any broken shotcodes within any frontend site content without removing. In normal just after you activate the Cleaner, it will clean your content automatically without any click, but we offer more control and settings for you. 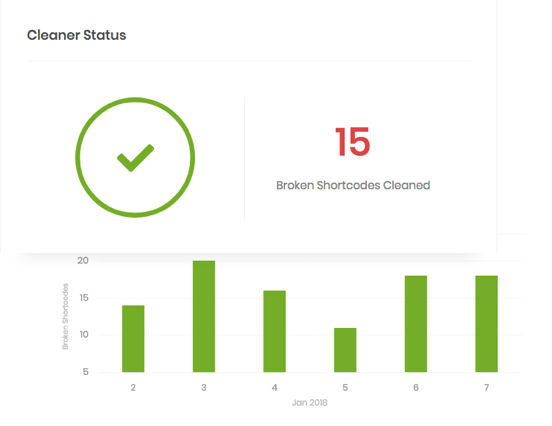 Cleaner have dashboard reports to know everything about the broken shortcodes like numbers, names and historical data of it. Cleaner Status show you number of broken shortcodes. Cleaner History show you data of broken shortcodes numbers per month. List of all broken shortcodes and where its found in. 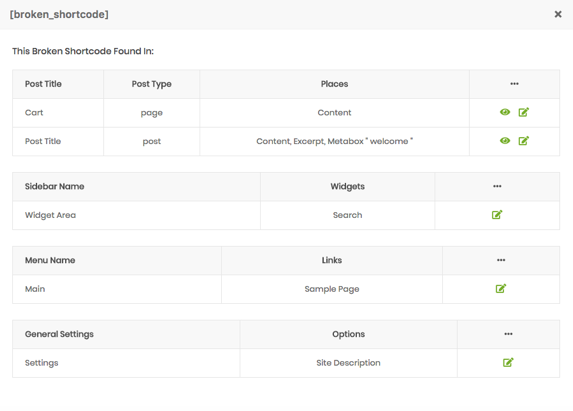 You can see broken shortcodes list and know where exact found in post, page..etc and also the places found in for exact post, page .. like content, title, excerpt, or in widgets, settings, menus, so you can view or edit it. Posts, pages, custom post types . Menu Links and Settings Options.